She soared through "Un bel di," floating the notes of that famous aria above the stave. The singer also displayed a thorough understanding of the nuances of the part, including the long dialogue scenes with Goro and Sharpless, and her interactions with Trouble, the fruit of her one-night stand with Pinkerton. Finally, Ms. Rohm displayed great power (and some wonderful low notes) in the final suicide. Tenor Daniel Rodriguez has had so much build-up in the last decade that it was refreshing to actually see him on stage. The Brooklyn native is best known for his transition from the New York Police Department to a recording career and tutelage from Plácido Domingo. His teacher's influence was audible: a dark, slightly baritonal tenor. It rang out with spinto power in the big, heroic moments, although the gentle seduction of Butterfly didn't have much in the way of subtlety. For once, the added Act III aria did not seem superfluous, but an expression of genuine heartbreak. Mezzo-soprano Yajie Chen was a complex, fully realized Suzuki, providing sturdy support in the second act and a gorgeous meld with Ms. Rohm in the "Flower Duet." Justin Ryan displayed a warm, fatherly baritone as Sharpless, lending dimension to the American consul and genuine conflict as he read Pinkerton's letter. Aaron Blankfield walked the fine line between comedy and sleaze as the marriage broker Goro. The scene where Suzuki beat him with a broom was the one genuine comic moment. He ended the opera by abducting Butterfly's child--presumably on Pinkerton's behalf. The supporting cast, particularly the firm bass Isaac Grier as the Bonze, was solid. 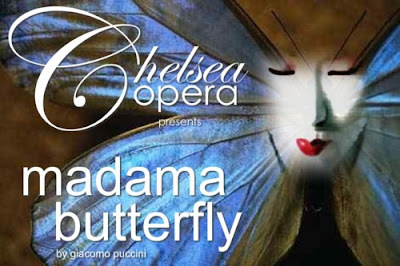 Chelsea Opera music director Carmine Aufiero led a crisp, incisive performance of the score, despite having the brass, percussion and harp parts provided by an electronic keyboard. An unjacked cable produced a notable buzz in the opening bars of the third act, but was quickly fixed. Technology has its limitations.